Welcome to the Southwick Associates newsletter focusing on market research and economics related to hunting, shooting, fishing, and other outdoor recreation. Southwick Associates’ continues to develop hunting and fishing license data dashboards for state fish and wildlife agencies, which help identify trends and areas where marketing attention may be needed and to help monitor the effectiveness of state recruitment, retention and reactivation (R3) efforts. Many state agencies struggle with being able to quickly and accurately track license sales trends and participation patterns. 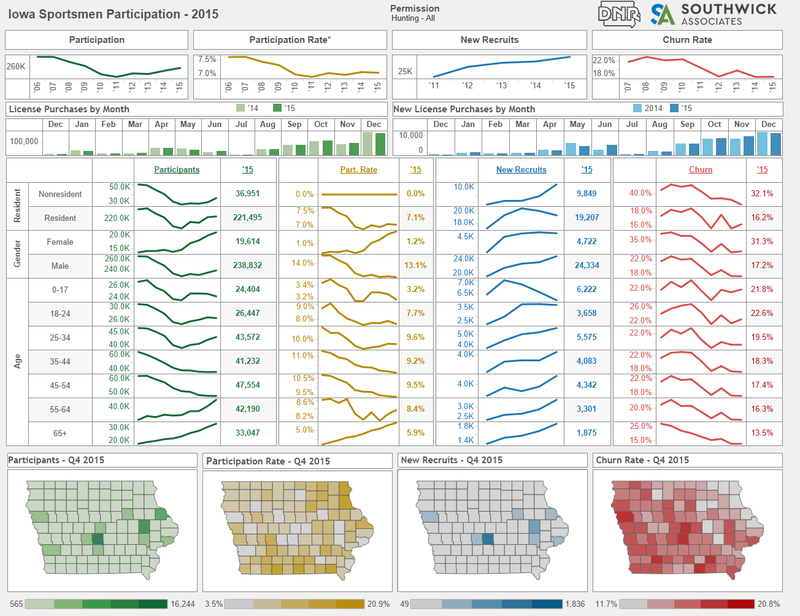 Enter data dashboards – A new tool that enables state agencies to focus their limited R3 resources on the areas that need it most. For example, “What are our license sales and participation trends among Millennials? Women? By Counties?” “Are targeted audiences responding to our marketing efforts?” Data dashboards can help answer questions like these. Data dashboards are interactive, visual displays of license data that help enable state agency staff to become easily informed on related trends and patterns. Since they use an open-source, anyone in your agency can view them for free. Initiated by the Western Association of Fish and Wildlife Agency’s HASSWRP Committee, the data dashboard concept is a scorecard to track R3 efforts, and Southwick Associates has advanced this concept via digital data dashboards. The first versions have been built for Oregon, Iowa and Wisconsin, with others in various stages of development for six additional states. Ultimately, the goal is to turn state dashboards into regional and national dashboards to help track progress for various hunting and fishing R3 efforts. Each state that is producing a dashboard is requested to create four core metrics: number of licenses sold for each major type of license, public participation rates, number of new license buyers and churn rates. For dashboards that are produced by Southwick Associates, these four metrics are automatically produced. The core data will then be tied together across states as part of an initiative to create regional and national dashboards. Further, state agencies can monitor metrics of special interest, such as boat registrations, hunter education graduates, specialty hunting and fishing permits – nearly anything that is housed in their databases. The first dashboard costs $13,500, with each quarterly update costing $4,500, depending on the custom information to be added. For more information, contact Lisa Parks at Lisa@SouthwickAssociates.com. In 2015 and 2016, the Georgia DNR, in partnership with the RBFF and NSSF, engaged new anglers and existing hunters by utilizing a series of email communications and produced spectacular results. Both of these programs were designed, implemented and evaluated with the help of Southwick Associates. Four treatment groups and a control group received a thank you message following the purchase of their license. Each treatment group received a series of license renewal reminders at the end of the license term. Treatment groups also received combinations of newsletters and a follow-up survey and/or a discounted license renewal price promotion to continue the dialogue and encourage anglers to renew their licenses in the following year. The email communications generated a 4.7% increase overall in the license renewal rate compared to the control group, which translates into an additional 1,448 licenses sold – more than $18,000 in added revenue. In addition, anglers in the treatment group renewed their licenses more quickly than those in the control group, an average of 18.8 days compared to 30.5 days respectively. RBFF has packaged the email templates and results into a retention toolkit for distribution to all state agencies. This can be found on https://www.takemefishing.org/getmedia/ebe9209a-dc87-454b-9c32-7c5187f0db38/ReactivateLapsedAnglers_DirectAndEmailMarketingToolkit. 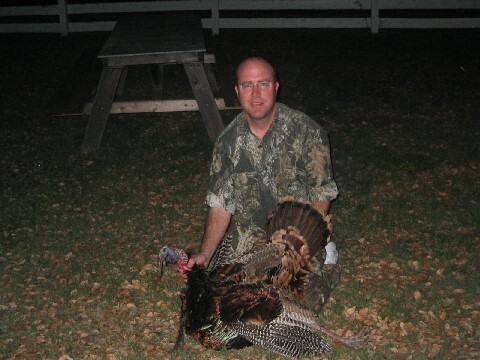 In a similar effort sponsored by the NSSF, the Georgia DNR also sent emails to five groups that contained various combinations of email messages – much like the angler campaign except all existing hunters were included, not just first-timers. Again, all five groups received a thank you message following the purchase of their license and each treatment group received a series of license renewal reminders at the end of the license term. The 63,191 hunters in the four treatment groups received combinations of newsletters and a follow-up survey and/or a discounted license renewal price promotion to continue the dialogue and encourage hunters to renew their license in the following year. Overall, the email communications to the four treatment groups generated a 3.6% increase in the license renewal rate compared to the control group. The program led to an additional 2,301 licenses being sold in Georgia, which is $43,766 in added revenue. On average, members of the control group renewed their licenses an average of 3.8 days early, while members of the treatment groups renewed their licenses an average of 5.7 days early. “We knew that email communications worked to drive revenue, we just needed a way to measure how effective they actually were and these studies did just that. We are so glad to be able to leverage the expertise of great partners like Southwick to retain and reactivate hunters and anglers and ultimately add to our revenue stream and proving a return on investment.” said Rusty Garrison, director, Georgia Wildlife Resources Division. Together these two easy-to-run programs netted $61,867 in hunting and fishing license revenues for the DNR! For help in planning, implementing and evaluating a similar program for your agency, contact Lisa Parks, Lisa@southwickassociates.com. Recreational fishing brings a myriad of economic benefits to communities throughout the U.S. The American Sportfishing Association (ASA) and Southwick Associates have released the 2017 update of the Economic Contributions of Recreational Fishing: U.S. Congressional Districts, along with a new series of one-page infographics, which depicts recreational fishing’s economic impact on all 435 Congressional districts and the 50 states. The information in the report and infographics is based on data from the U.S. Fish and Wildlife Services’ National Survey of Fishing, Hunting and Wildlife-Associated Recreation, conducted in conjunction with the U.S. Census Bureau, as presented in ASA’s Sportfishing in America report. 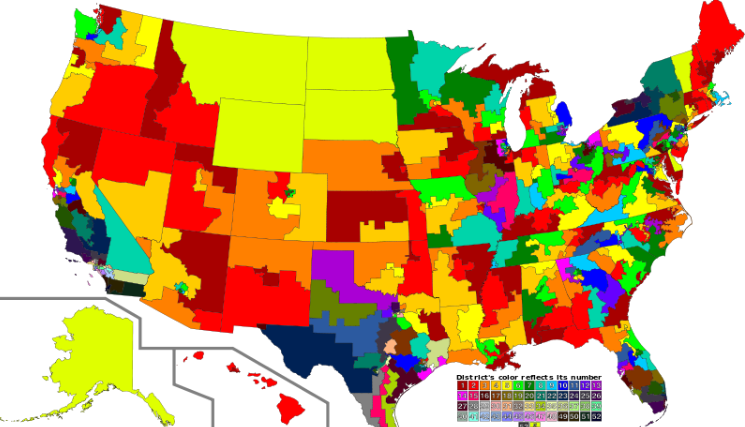 The study incorporated mapping and population software to hone in on smaller geographic areas in a way that is particularly relevant to the Members of the U.S. House of Representatives. The results in the Economic Contributions of Recreational Fishing: U.S. Congressional Districts report describe the economic contributions for the respective state economies from anglers who live within each congressional district. America’s 46 million anglers generate more than $48 billion in retail sales with a $115 billion impact on the nation’s economy creating employment for more than 800,000 people. Recreational fishing is the foundation of an industry that involves not just the manufacturing, sale or provision of tackle and other fishing gear, but also includes services such as boat builders, hotels, restaurants and much more. The report and Congressional district infographics are available at www.ASAfishing.org under Facts & Figures. For any states that are interested, Southwick Associates can produce this information for state legislative districts, contact Rob@southwickassociates.com. Interesting trends on R3 (recruitment, retention and reactivation) emerged in a recent study on hunting and fishing license buyer habits in the State of Massachusetts (conducted by Southwick Associates). Massachusetts, a largely urban state and not generally considered a sporting destination, experienced sales increases for fishing licenses (6 percent) and hunting licenses (3 percent) between 2012 and 2015. This rate trended ahead of the rest of the country, which saw fishing and hunting license sales only increase by 1.3 percent and 0.4 percent, respectively. Interestingly, growth is not occurring in rural areas as might be expected. While rural residents still have the highest per capita rate of buying licenses, the highest rates of license growth are taking place in urban and suburban areas. Gen Xers, those between 35- and 54-years old, are “basically a lost generation among license buyers,” compared to 15- to 34-year-olds and 55 years old and older, who are buying licenses at faster rates. Churn rates, those hunters dropping in and out of the sporting ranks from year to year, are lower than national rates but still high enough to remain concerned. Boosting retention efforts is likely the cheapest way to increase participation and license sales. 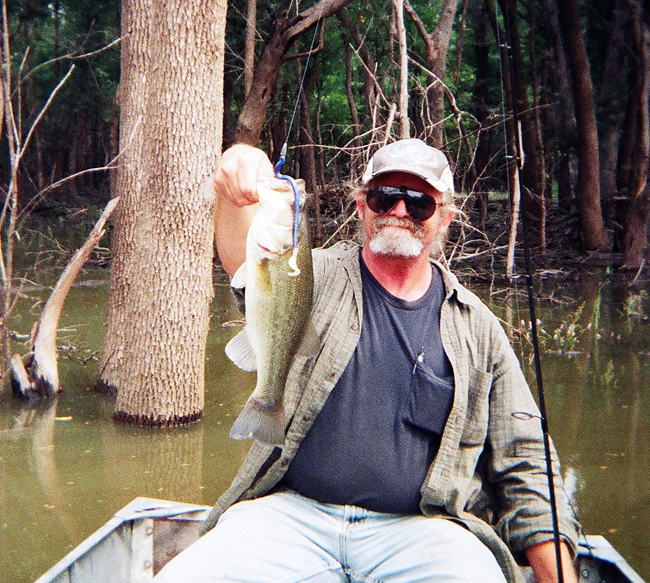 The typical renewed fishing license holder accounts for approximately $59 in revenues compared to the average returning hunter who is worth about $162 for the state. Many more insights are provided in this 133-page report. For more information, contact Rob@SouthwickAssociates.com. 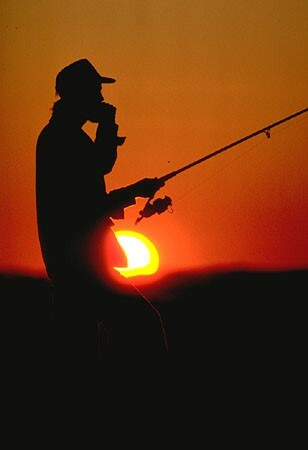 In recent years, sportfishing and hunting have remained resilient. During the time of recession (2008-2010), sportsmen and women still purchased licenses and our industry fared better than many others. Economic shock caused many people to reconsider their hobbies and consumption habits and to look for greater value. After re-evaluating what’s important to them, fishing and hunting often rose to the top. At the same time, many of the national and state-level sportfishing promotion efforts started to mature and pay results. As a result, with extra time on their hands and greater encouragement to get outdoors, people hunted and fished more often. License sales increased after long periods of decline. Though not all sectors in our industry fared equally well, our industry did better than many other parts of the U.S. economy. Nine years after the start of the Great Recession, unemployment is back to normal levels, interest rates are still historically low, and reports from the travel and tourism sector show that people are heading out in record numbers, spending money and enjoying low fuel prices. With employment at low levels, employers are now starting to pay higher wages to find and keep good talent. People are using their money to buy new cars, build new houses, and this is a good thing, so goes common wisdom. But maybe it’s not as wonderful for our community. We all want to see economic prosperity, especially when we look at our retirement funds, pension plans, savings and other investments. We don’t want to see slower economic growth but with all good things come trade-offs. Many sportfishing and hunting enthusiasts are in the trades like construction, and the heated economy means opportunity to earn more cash. Overtime hours are offered, and small business owners agree to work longer hours and weekends to win the extra business. However, extra time spent at work means less time playing. As people work more, there’s less time to fish and hunt. This was evident prior to the recession when the economy was superheated around 2004-2006. Low interest rates and no-questions-asked loans put many, many people to work. There weren’t enough people to fill all the jobs. Fishing and hunting license sales and tackle purchases didn’t grow as fast as other industries when our customers worked overtime. Many of the statistical models developed by Southwick Associates for businesses and state agencies at that time illustrated that with increases in housing starts, growth in logistics (trucking, warehousing, etc.) and other similar factors resulted in decreased fishing and hunting participation. Now we see healthy growth rates in the U.S. in these sectors, with new home sales reaching high levels. People still want to fish and hunt, and they have the money to do so. License and equipment sales are doing well and barring any extreme weather or human-caused shocks, we can expect steady growth in the near future. The double-edged sword of rising interest rates may ease employment shortages, allowing more of our core customers time to fish, hunt and buy our products. It’s up to us, the fishing and hunting community, to market fishing and hunting, to encourage them to make outdoor plans before other things steal their attention. We need to remind people of the fun they have when fishing and hunting. Encourage them to plan ahead, to contact their friends and make commitments to get outside. If we work together to keep people fishing and hunting, there’s no reason growth rates can’t match other growing markets of our economy. 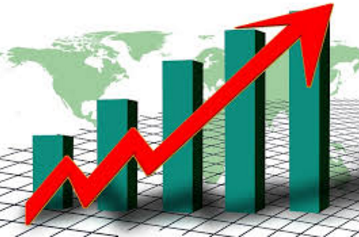 Be smart, employ intelligent plans and the next several years should bring steady growth. Southwick Associates is a market research and economics firm specializing in the hunting, shooting, sportfishing, and outdoor recreation markets. Celebrating 25 years in 2015, Southwick Associates is renowned for delivering comprehensive insights and statistics assisting business and strategic decisions across the entire outdoor industry; from government agencies, industry associations and non-profit organizations, to affiliated businesses and manufacturers. Aside from custom market research, and economic impact studies, Southwick also provides syndicated participation, media consumption, and equipment purchase tracking studies utilizing their three proprietary sportsmen panels. Visit www.southwickassociates.com for more information.